The Roughnecks head to Saskatoon this Sunday to take on the Saskatchewan Rush in the NLL West Final. The Rush swept the 2018 regular-season series against the Riggers 3-0, but two of those victories came by just one goal. Here’s a breakdown of this year’s Battle of the Prairies. In their first meeting this season, the Rush defeated the Riggers 13-12 in overtime at the Scotiabank Saddledome on Jan. 27. Down 5-3 at the half, the Roughnecks tallied five goals in the third quarter and three more in the fourth quarter to tie it up. It was Dane Dobbie who knotted the tilt at 12 with 0:59 remaining in regulation. Rush forward Ben McIntosh scored the game-winner 0:46 into OT. Despite the loss, the game was a turning point in the Rigger’s campaign after going 1-4 to start the season. With their fifth loss marked by this game, the Roughnecks gained footing and followed up with three straight victories against the Toronto Rock, Colorado Mammoth, and Vancouver Stealth. The Rush put an end to the aforementioned win-streak on Feb. 24, as the Roughnecks fell 10-6 at the Sasktel Centre. Saskatchewan came out hot and tallied four in the first quarter, but the Riggers held them to three or less goals per frame for the remainder of the game. Christian Del Bianco stood tall in net stopping 42 of 51 shots, and Wesley Berg also had a solid night with four goals and two helpers. Overall the game was not a bad effort from a Roughnecks team that was a man-down for almost an entire 15 minutes: The Riggers served 13 minutes on five infractions – Saskatchewan only served six minutes on three infractions. 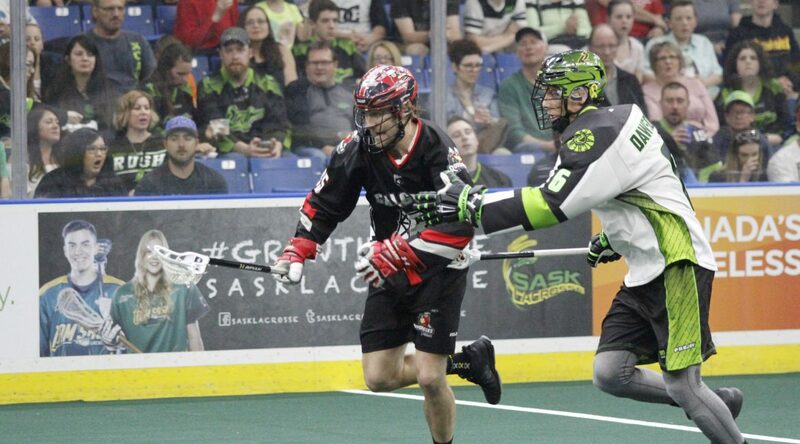 The clubs played each other close once again in their final tilt of the regular-season, as the Rush edged the Riggers 11-10 on April 28 at the Sasktel Centre. After a scoreless first frame for the Roughnecks, they stormed back in the second quarter with five goals to tie the game at 5-5 heading into halftime. However, the Rush answered back with four in the third to go out front for good.